Home Article Samsung Galaxy Tab 3 8.0"
While there were few surprises when theGalaxy Tab 3 7.0 swung past the FCC, we didn't expect additional tablets all that quickly. However, we're already looking at one today: a Samsung SM-T310 has just reached the US agency carrying 16GB of storage, Bluetooth and Wifi. 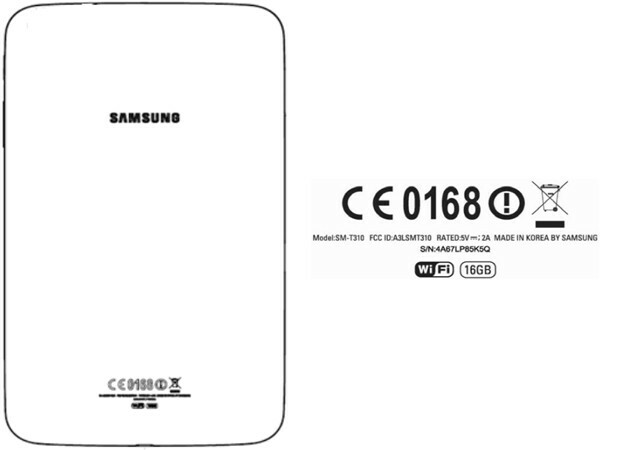 The device listed as Samsung SM-T310 runs Android 4.2.2 on a 1.5GHz processor with Mali-400 GPU. It’s an Exynos chipset most likely, though it’s not really clear if it’s a dual-core like the Tab 3 7.0 or a quad-core like the Galaxy Note 8.0.The resolution of the screen is 1280 x 800, same as the Note 8.0, giving the 8″ screen a pixel density of 189ppi.According to rumors, the Samsung Galaxy Tab 3 8.0 will be a slender device measuring 209.6 x 112.1 x 6.95mm and weighing 330g. Other rumored specs include a 3MP camera on the back, a 1.3MP camera on the front and a 4,500mAh battery.